Almost every device we use contains microprocessors – aka chips – that power these electronics. This includes but certainly isn’t limited to smartphones, tablets, desktop computers, laptops, etc; chances are you have at least one of these items in your possession, which means you could be vulnerable to a security breach or exploit thanks to two of the newest cyber-style attacks: Meltdown and Spectre. Simply put, Meltdown and Spectre are two security flaws found in these microprocessors and CPU’s that exploit common built-in features; this means that it isn’t a flaw with the CPU or microprocessors themselves or a program bug found in an application, but rather found at a level “in-between” where all of these devices are rooted in their security, such as their memory. Meltdown and Spectre both circumvent those security measures, leaving any and all data on any of these devices vulnerable for the taking. Even some web browsers are at risk, such as Chrome and Firefox, as Mozilla confirmed that similar techniques can breach similar vulnerabilities. Both of these threats allow programs to steal data from devices, including passwords stored in password managers, personal photos, and documents or files. This means that essentially anyone who owns any of the above devices could potentially be affected, but not nearly to the severity being emblazoned across the media. Are you affected by these vulnerabilities? More than likely, yes. But that’s no reason to panic. Many companies across the board (Microsoft, Intel, Apple, Google) are working feverishly to build and implement patches to help protect these vulnerabilities, many of which may have already been pushed to your devices as updates. Now would be a great time to see if your device recently updated or needs an update to ensure security, which you can do by checking System Settings across your devices. Companies will continue to push these patches and updates out as they come available, so keep a watchful eye out for them and be sure to complete them as soon as possible. What else can you do to protect your information? 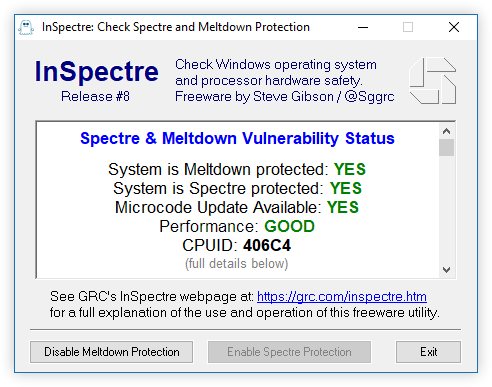 As the basis of protecting your devices lies in making sure the system processor – or BIOS – is updated, there is a new utility application out that can be used to determine if your device is protected from both Spectre and Meltdown. Clicking this link will direct you to a landing page where you can download the application by clicking the blue-green “Download Now” button. In the event that it states you are not protected against either or both of the vulnerabilities, we highly recommend checking to be sure that your device is completely up to date before worrying. Chances are, you may have an update waiting in the wings to be completed that will include a patch. If you’ve completed any updates and it still shows you are vulnerable, give us a call and we can chat about what other steps to take. Lastly, if you’d like to take that extra step in securing your information, it’s always good to update your passwords for your devices and sensitive accounts, such as your online banking. Be sure to include a variety of characters in your passwords, including capital and lowercase letters, numbers, and special characters. The more complicated the password, the harder it is to crack! Our office is always open to questions regarding Spectre and Meltdown, and we are more than happy to walk you through your options regarding your device security. Don’t hesitate to give us a call at (858) 345-0382 or email us at support@mobilecomputerwizard.com.